From left, Katie Delaney Claire Daniels get out in front of the pack at the Winding Trails Invitational on Sept. 22, 2018. 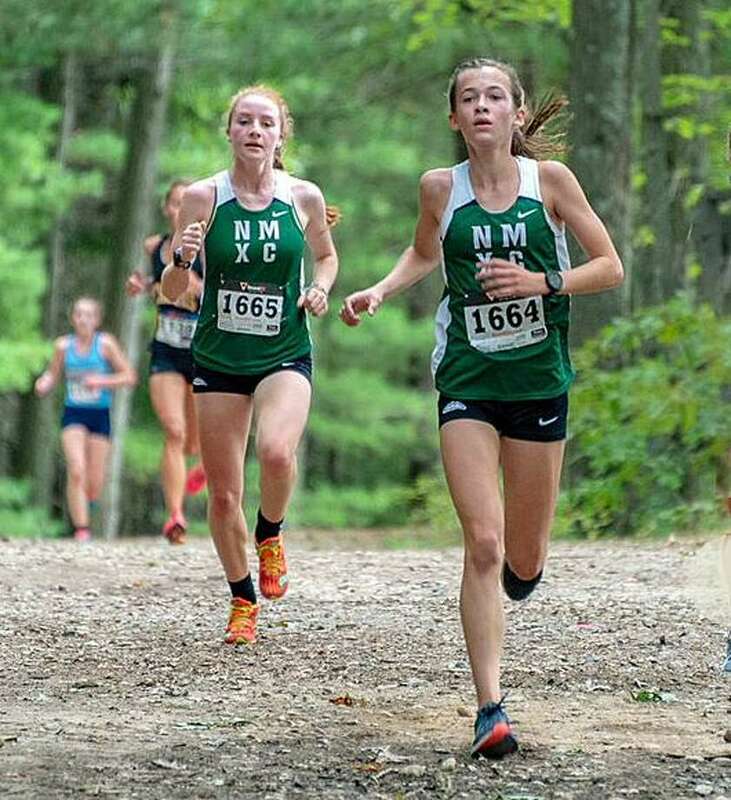 The New Milford girls cross country team completed the 2018 season by sending a pair of runners to the New England Championships on Saturday. Claire Daniels and Katie Delaney ran at New England’s and represented New Milford well. “On a super tough course in rough conditions Claire and Katie did great,” New Milford girls cross country coach Giles Vaughan said. Daniels continued her consistent performance, coming in seventh with a time of 18:57 - only a few seconds off her fastest time of the year. Delaney finished her high school cross country career placing 69th with a time of 20:24. She made up ground after falling in the mud at the start of the race. Vaughan estimated that the course’s wet conditions added 15-20 seconds to everyone's time for the day. The championships marked an end to a notable season for New Milford. The Green Wave finished with a 10-3 record. Their dual meet losses came by forfeit (due to race date change) and a disqualification of their top runner in another race. New Milford captured first place at the Winding Trails Invitational as well as first place at the Nonnewaug Invitational and first place at the Wickham Invitational. The Green Wave finished third at the SWC Championship, losing in a tie break for second. Daniels, Delaney and Brooke Morabito all made First Team All Conference, and Shannon Palmer was named Second Team All Conference. As a team the Green Wave finished third at Class L, and missed a state title by seven spots. Daniels, Morabito and Delaney all made All State. New Milford also finished eighth at the State Open with Daniels and Delaney qualifying for the New England championships. A freshman, Daniels won the Class L title and emerged as New Milford’s best runner this season. It helped that the leaders on the team took to their new teammate and helped push her throughout the season, her coach said.